Our RideON program features Strider bikes. We work with Strider and local therapists so your children can feel the freedom of riding a bike with friends and family. Strider Balance Bikes break down the overwhelming task of learning how to ride a bike. Striders are low to the ground so your child’s feet can always touch the ground – they can move and stop the bike with their feet like a scooter. Your child will learn balance, control of speed, turning, and braking. Your child may continue to enjoy a glide bike. Others may take those skills to a two wheeler with pedals. With the Strider Balance Bikes, we have served children with Down syndrome, autism, low muscle tone, poor balance, arthrogryposis, and cerebral palsy – helping them to enjoy all the benefits of cycling. RideOn camps provide children ages 3 – 16 with a solid foundation to learn to ride. There is no cost to this program. Click the dates below to register for the 2018 RideON Camps. "Good groups of smiling facing and helpful people. Had a good time and learned a lot. My first time out in my life, I enjoyed myself."  Volunteer to assist children 3-16 to learn skills needed to ride a 2 wheeled bike. Skills include stepping over the bar onto the bike, balance, control of speed, turning and braking. Volunteers will make sure kids have helmets on, encourage them through the lesson and do lots of cheering. Buddies are need to pair up with the children. Great opportunity for younger volunteers to assist! Click the date below to volunteer for the 2018 RideON Camps.